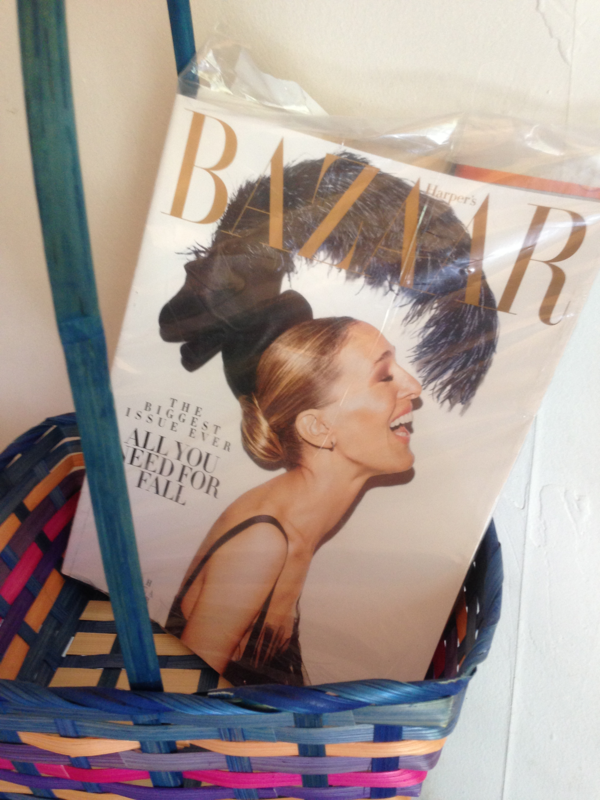 The September Harper’s Bazaar just arrived in the mail, wrapped in plastic. 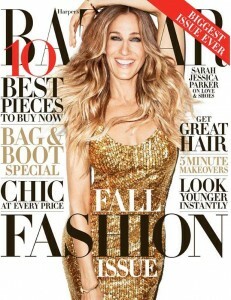 The cover is Sarah Jessica Parker, her head thrown back in joy, balanced by a magnificent feather head piece, an amazing photo! The fascinator was by Ellen Christine, the photo by Terry Richardson and the styling by Andrew Richardson. Ellen Christine has emerged as one of the world’s preeminent milliners. WWD in a backhanded compliment about her appearance on the cover, posited that Vogue and Harper’s Bazaar are dueling over Sarah Jessica Parker’s hat. Vogue had put Parker forward in a Philip Treacy, while Harper’s Bazaar shot back with Ellen Christine. (In a hat fashion world where British men often take top billing, it is notable to see a woman – and an American.) But Women’s Wear Daily seems to have an issue with what they call the “hat arms race”. Their reporter Erik Maza invites controversy – controversy pays well on ad supported websites – by asking readers to tell them “does anyone still wear a hat?” Read Ellen Christine’s response here. 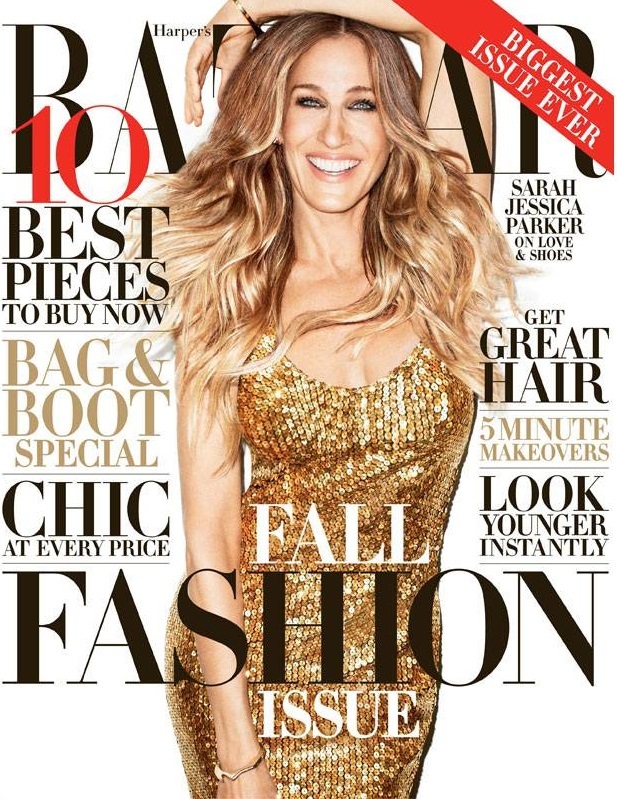 Search online for “Sarah Jessica Parker Harper’s Bazaar Cover” and you will find 20 different articles from August 6th about the coming September issue – all showing a beautiful full body cover picture of her in a gold Marc Jacob dress. This cover also has a lot more text saying things like “BIGGEST ISSUE EVER”, “FALL FASHION”, “10 BEST PIECES TO BUY NOW”, “GET GREAT HAIR”, “LOOK YOUNGER INSTANTLY”, etc. What is going on here??!! Did someone do a press release that tricked all the news outlets before the issue came out? Did Harper’s Bazaar decide to change the cover at the last minute? Do they have several covers for different parts of the country? The last answer is closest to the truth. There is one cover for the newsstands and one for the mail subscribers. There may even be a third “editorial” cover of SJP in an Oscar de la Renta gown. It appears deep inside at the p. 168 masthead. Some of the sites that show only the news stand cover — and not the hat cover — are below. Why does Harper’s Bazaar have different covers for subscribers and news stands?